Childhood as an elf is a strange affair. Or at least, it was for me. My parents didn't live in the forests of Arathnos. I never could get them to say why, just vague explanations that I hardly recall now. Still, growing up near the city of Xantheus was an enlightening experience. I spent much of my early life roaming the country, finding little nooks in the fields where I could let my mind wander. I was allowed a great amount of freedom, as long as I was home for supper. Birthdays, I remember, were another thing entirely. An entire day spent in rituals and other such nonsense, I didn't understand at the time why. Now, I'm glad my parents had the foresight to include such things in my upbringing. At the time, however, I was much enamoured of wandering and detested my birthdays as a day stuck at home, or trekking to the woods. Not that I disliked the woods. Indeed, once my senses tuned, the feeling of life all around was comforting. I began to spend more time exploring the forests nearby. By that age, I was allowed the occasional two or three days absence, more because I spent the time going to and from the forest than for any increased responsibility, I think. Occasionally one of my siblings would join me. Those times were always a bit tiresome, none of us got along particularly well for some reason, but those trips were somehow more fun too. Those are the memories I think I cherish most, walking among the trees with a brother, climbing them with a sister. But I'm wandering again. I do that a lot, live with it. My first trip into the city was memorable. My family lived a rather secluded life. No neighbors within a few miles. I remember always wondering where my father went when he left for a few days and came back with supplies the family couldn't make on it's own. One evening he asked if I would like to join him. Of course I agreed. So we woke early, hitched the horse to the cart, and off we went, chewing on a loaf for breakfast. Camping that evening with my father is one of those memories that you can't forget. I remember we argued about a few trivial things, placement of the fire and all that. I thought him over-cautious. I know better now. But most of the evening was spent with me listening and learning all the lore of the forest my father could give in one evening. We rarely discussed such things at home, he always woke early to be about the business of running the farm, and always retired early from exhaustion. I learned more in that one evening, however, than ever before in my life. Reaching the city the next day was another awakening. So many people. I was overwhelmed. Where did they all come from? What were their stories? My father, however, was all business. A practical elf, to say the least. We got our bartering done, and that was that. In all the crowding I couldn't really stop and examine things as I would have liked, and the noise soon got to me. I was glad when we finally pulled away and headed back west. But I knew I would return. One day. The trip back went much as the first, though I deferred to my father's wisdom in setting up the camp, more because I was somewhat introspective than through any wish to avoid conflict with him. We had an interesting relationship, my father and I. I could argue all I liked, even though he always ended up right. At the time though, I was still trying to absorb what I had seen. Years passed, as such things tend to do, mostly unnoticed in my life. 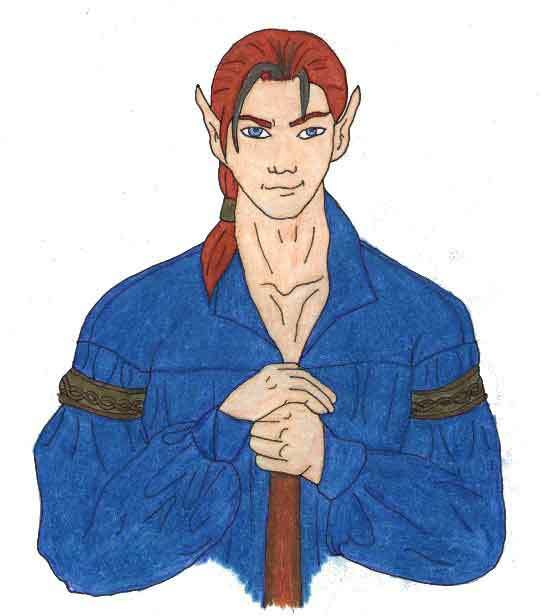 Elves mature slowly, an affect of such legnthened lifespans, and my formative years were as long as any other elf. You can't really point out the things that make an elf what he is from his childhood. It's so drawn out that even the most traumatizing experience gets laid over with so many years of other things that it fades. Impressions on young elves must be sustained over many years. So the impact from that first visit to Xantheus faded long before I was ready to set out on my own. Of course, there were others. Many times I went with my father to that bustling city in the wilderness. It's one of the events that most shaped my life. It lead me to the life I live today, and sometimes, in those dark hours before dawn, or standing before the gates of the Temple of Chaos, I wonder if perhaps my father knew what he was doing when he took me with him. I do know that my siblings are still all on that farm, living in their small circles and prospering. I love them, perhaps belatedly, but our lives do not cross anymore since my parents died. That is an occasion that you won't hear about from me. But I wander again. Foible of an old mind, you'll just have to live with it. Anyway, as I said, my father took me to Xantheus often. About 4 times in a year, depending on the needs of the family. I soon grew accustomed to the noise and crowding, though I never really grew to enjoy it as I understand many humans do. Always the return to empty fields was a joy, as much as the city itself was a wonder and excitement. At any rate, at the rash young age of about 30 I took over the job of supplying the family from the city. This was a dream, since my father outright told me that as long as I was back by the time they ran out of anything I could spend as long as I liked away from the house. Thirty years of general observation was plenty of time to learn how long it takes the family to go through a rack of candlesticks. On the other hand, I missed out on some of the joys of family life. My sisters' marriages, my brothers' marriages, etcetera. Not that it concerned me overmuch. After all, they'd be around for centuries, but that forest over there will look completely different tomorrow. Likely this time period was when I grew apart from my family the most. I became very self contained for an elf. I understand that "normal" elves love frolicking about in the deep woods with their extending families dancing and singing all night. Well, I'm always one for a good party but I spend a great deal of my time alone even so. I quite enjoy wandering the lands of Arathnos with nothing for company but my whips and a good walking stick. So, as I said, I pretty much moved out at this point. Opting for the lonely road and the next hillside over the crowded farmhouse and the next coow to milk. Never let it be said, however, that I didn't keep up with the news. I always arrived with fresh supplies just before they ran out of anything, and it was always a cheerful reunion. I can handle my family in small doses. So I'd stay for a couple days and catch up on the gossip before heading out in a new direction. Until the one day when I came back and my parents were gone. At that point I must have been about 50 or 60. My eldest brother had taken over the farm, of course, and life had moved on. Grief is a very private thing, and I will not discuss it here, just as I could not discuss it with my family. I told my brother that he'd have to take care of supplying the family himself somehow, and drew him a very complete map to Xantheus. Then I left. I never went back there though I did keep watch on my brother's first trip to town in case he should need assisstance. After that I wandered in a haze. If any of you have seen a mourning elf you'll know how sorry a sight it is. I must have wandered like that for a good year, watching my brother's trips and wondering how he managed to stay together. Eventually I found myself again at the gates of Xantheus. Standing in the shade of the West Gate at dawn I considered all the strong, sword wielding types wandering nonchalantly out of the gate. You could tell which one's knew what they were doing. Aside from the graceful carriage of sword and armor, they were possessed of a certain wariness in the eyes. They never looked at one place, nor did they stand still for long. I had, of course, allready acquired those arts of survival from my days wandering. Having nothing better to do with myself than slink off and weep some more, I decided it was time to hone those skills I had learned, and set off into the city to find a place to do so. I asked around a bit and was quickly directed to a place called the Academy. I wandered about in this place, talking with the helpful people within, until I came upon my first opponent. Easily slain, this was a bare minimum of challenge. I grabbed what loot was left unsullied from the fight and moved on. At this point it all turns into something of a blur of red, green and brown. The colors of battle and death on the hard dirt backdrop of the Battlegrounds of the Academy. Many slugs, wolves and naga did I kill ruthlessly, and yet they always came back. Somehow, I was certain they would. New horizons were opening for me, however, and the font of all this strange new knowledge I was discovering is still unknown to me. It was sometime shortly after this period, when I had moved on to the gnomes of the Shattered Refuge as convenient targets, that I met the vampire Erilyn. Author's note: My memory beyond this point is rather blurred, things got more complicated for some reason. You may notice some discrepancies in timing, and it may not make sense the first time read. This is, after all, my memories and not a historical document, and a person's life is rather difficult to render down to a timeline of cause and effect. So I will tell them as I remember them, or in whatever order seems best to me. Let me see if I can remember this properly. I believe I was standing around in the town square looking at some junk I was carrying around. Minding my own business you understand. Well, I look up from translating a large stone tablet and realize there's a rather pale lady looking at me. With fangs. Large fangs, to my eyes. Now, you have to understand, rural elves don't run into vampires much. Not enough people around to provide sustenance and all that. So seeing this woman, a very good looking woman mind you, with fangs was rather unbalancing for me. Of course, she turned out to be quite helpful, with armor and spells. After a rather unfortunate social gaffe on my part, how was I to know vampires detest stakes, I'd never met one before, she aided me in garnering some much needed experience in the world and with the beginnings of my now massive general knowledge of Arathnos. Eventually she would drop out of my life, but in the meantime she was a good friend and guide in this world. I noticed upon her person as well a tattoo of a sort that looked rather symbolic, as opposed to decorative. I can't imagine many people who might just randomly pick a blood red dagger over a black rose to adorn thier neck with. So I asked her about it. That began my long journey into the clan Nightmare. I spent many long years among my brothers and sisters of Nightmare. It was within that clan that I learned much of what I now know about the world. It's members were most helpful with both knowledge and a rather massive collection of, well, assorted bric a brac in the clan chest. Some of it most useful, some of it more curiosity. I understand that is the general nature of such treasure hoards. To return to the beginning, however, I was dully inducted into the clan, sometime in my late seventies I believe, in a semi-solemn ritual that I won't discuss here. Except to say that it involved a lot of bloodshed. Mostly mine, not that I minded. I was, to finalize the induction, given a tattoo myself, the dagger and rose, on the side of my neck which I carry still in rememberance of what Nightmare was to me. I jump ahead of myself though. Let me explain what Nightmare was, before I talk of remembering it. When I was inducted into Nightmare, a young elf not displaying over-much in the way of potential, I was given a great deal of knowledge and equipment to my disposal, and shown more friendship than either. The clan chest was made open to me, which I definitely raided a couple times, on the sole understanding that I would put back as I took out, which I did. More helpful than that was the genial atmosphere with which I was recieved. Any question I asked was quickly answered by one of the many knowledgable members, and I spent many days doing nothing more than wasting time in the clan headquarters tossing elderly pixies and vampires indiscriminately into springs of my own devising. Of course, I received my own share of dunkings, but I've always liked water. I would remain a member of Nightmare well into my fourth century, sharing in the celebrations of acheivement and helping in the recuperation after losses. Some time shortly thereafter things started heating up in Nightmare. Some strange changes were taking place and it seemed that an old decision was to come back to haunt us. Sometime deep in the past Nightmare had merged with a group known as Nightshade. I know no more of Nightshade than it's name and that it was dedicated to peace. Odd name for a peaceloving group, but there you are. At any rate, for some reason there was a movement within Nightmare to split again into these two component parts. What that translated to was the strangest hierarchy of command I've yet to see within a clan. It was time for me to go. I was deeply saddened by the loss of my clan, but it had become something I no longer recognized. People I thought I knew were posting public notes in a tone I had never heard them take before. So much to the regret of all sides I took my leave of Nightmare, before it became fully what it is now. Yet I still bear it's mark upon my neck. A reminder of friends I still have, and another home lost. I won't bother to go into my long explorations of Arathnos. Suffice to say I found many pitfalls and dangers, and barely escaped with my sanity intact. At some point during this I discovered a part of the nature of life. While in my earlier years as an adventurer, as such I had unknowingly become, I was content to be a slayer of good things. While easy to do, and simple to maintain, such a life soon grew tiresome to me. And so I turned to those evil things in the world, and as I killed them I discovered the balance of things. Each life is lived, and in time dies. So to provide for what comes after it. In all things there is a balance. Summer to winter, night to day. Knowing but one side of oneself leads to difficulty. But this isn't the forum to discuss such things. I must have been somewhere in my second century when I discovered this, and since then I have strived for balance in my approach to all things. I wish I could say that Nightmare taught me this, and perhaps they did to some extent, but they are, after all, a family composed primarily of vampires and thus all imbalanced in thier own manner. Not to criticise, for I have my own difficulties to attend to as well. I'm just glossing them over here because it's my story. You'll have to dig for dirt elsewhere. At any rate, armed and armored with my new outlook and close friends I assaulted the walls that held me back from the fullness of my power and eventually achieved the exalted status of avatar. Now at this point my story could end, this being a logical place to do so, but in fact, it is just begun. Being now at the peak of my skills, I set off to find new and interesting things. Anything that seems unusual I have probably owned. Poking around in unexplored corners, and occasionally getting my nose bit off for my troubles, I found any number of curious objects, some of which were even useful. So, I started a collection. Just bits and trinkets that I could pull out and play with at a party, should it grow dull. My explorations lead me through the Rift of the Jarl, along the frozen wastes in the same mountain range, and all throughout the tropical isle and Olympus itself. Eventually there was but one place left to explore, the infamous Hellspires. But first, one must catch up on the local gossip. Throughout my explorations much happened within the land of Arathnos. A new race made appearance. The Sh'kur. Now vampires and Sh'Kur don't get along very well. To say the least. Each seems to see the other as a giant bullseye for some reason. Great councils were formed, of which I decided not to take part, and lines were drawn as for a great war. This whole time period put me something at odds with my clan. It being composed mainly of vampires, and I unwilling to pass judgment on a whole race simply on what little grounds were given me by my friends. Actually, what I usually got when I asked why vampires hate them so was a long spitting diatribe about how evil they are. As though vampires have pure hearts by nature. But that's beside the point, I can forgive my friends their foibles. They wouldn't be the same without them. Anyway, I did my best to hold myself neutral in the conflict until an uneasy truce was declared, and did fairly well I believe. Albeit with a slight lean towards the vampires. Noone is perfect. Another interesting point among all the general mundane exploration of the everyday was the arrival of a certain vampire known as Ryissha. Ahh, quite the little minx that one. Had us all, or most of us... well, me at least for certain, quite tied around her little finger. That was a most interesting episode. Graucsh and Contradox were very put out with each other. Such things women make us do. I think they're all the same person at heart, some merely hide it better. I had my own.. "incidents" with her, but you'll have to get any more detail than that somewhere else. Never let it be said that it's people were the only things to change in Arathnos. At some point an entire island, a continent of itself, suddenly appeared on the horizon. Much too far to reach by magical means, even great powers like myself had to resort to the mundane motion of a boat to reach the island. Once there, however, an entire city opened up before me, with new lands to explore and more curios to collect. And mysteries to explain as well. Such as, how the hell did Markaugh's Isle, once so close to home, get so far away and become landlocked? I still carry around an elven sword I found in a tree over there. Who knows where it came from, but I find it reassuring somehow. And amongst all this great upheaval three other women entered my life. One was the daughter of Ryissha. Flame seemed to enjoy toying with me. However I never had any interest in her beyond friendship. I had known her mother after all, it just seemed indecent. Then there was Janna. My entanglement with the priestess of a god of pain brought me a new realization of just how lucky I am in my life. For all that I think I was able to ease her pain somewhat, I could never understand her ambitions. Which brings me to Rachel. Ah, the name rolls straight off the tongue and into the heart. For me at any rate. I'll try and keep the poetry down for all you poor cynics reading this. Burning red hair and bright green eyes, fae blood in her veins and everything else right where it should be. Who could want more? I still carry a promise. And yet I haven't seen her in ages. No trace did she leave after her disappearance, as quickly gone as come. Occasionally I hear rumor of a lady with fiery hair and no pupils wielding two swords in defence of some home or forest and always the rumor is fled when I reach it. Someday I may find her again. If we both live in the fullness of our time. And now I shall come to my sojourns into the Hellspires. Much of what I knew of them came second hand in the beginning. But I slowly learned the lay of the land and began a proper survey of the area. It was then that I discovered the portal that matched a key I had found previously. It would be some time yet before my attention shifted to the area beyond that portal. For upon entering the portal I was thrust into an ancient time. A period before the strength of man, a period when even elves weren't so clever, nor so wise. This area I explored as well, finding valleys overrun by ancient lizard beasts, and curios and equipment to satisfy the greatest hunger for loot. And a certain spirit of hatred, like the disembodied soul of the leper who despises everything simply for being whole. Upon dispersing the apparition I noted two trinkets fall to the ground. One would become a trusted bracer, the other a key to a world beyond sanity. Life is ever in chaos, that is a fairly given fact. However, it is chaos tempered with order. Death is a release from order, or from choas, depending on your religion. What I found when I used the key I had won was a world of shifting chaos. A world slowing dying under the weight of it's own power and decay. Obviously, I was meek as a mouse when first I entered this land of death. Exploring the decaying city I found it's many inhabitants reduced to mere zombie slaves of thier own death. Fiends ran amok throughout the streets, and beasts defying description laired in the buildings. Ghosts of immense power and dragons even greater, magical constructs and creatures from an age before the one I found myself in. For yes, the portals I had been taking were in fact throwing me back in time. I was in the Hellspires as they had been, in a past so distant as to be incomprehensible. Even the great creatures beyond the first gate live only in memory hundreds of years old in my own time. A cursed land, Hellspires. And I had reached the roots of the curse. A doomed city, playing host to a parasitic temple. I soon discovered the gardens that protected that temple in it's deadly arms, a hedge maze to end all. And lurking within it's twisty corridors a creature to put the labrynthe's minotaur to shame. The fiend's tail, however, makes and excellent tool. Assuming you can manage to seperate it from his backside. But I wander again. Beyond the garden, as though that alone weren't enough, lies the temple itself. Imagine a fire, a chaotic meshing of air, power, and wood, a great bonfire, with power enough to take down a forest. Now imagine pulling all the chaos from it, all the power, leaving behind air and wood. Now take what you have pulled forth and multiply it thousandfold. Maybe a bit extra just for kicks. Now solidify it in the form of a temple. The only order to the temple I saw before me is that which is required to have architechture. Any other order was apparently expunged from the designer's mind at birth. Great leering faces and corners that twist the eye in thier mishapen glory, to stand at the entrance to the Temple of Chaos is to stand before the brink of dissolution, to laugh at it's design, it's message, is to condemn your soul to forever follow the temple to it's doom. To enter the temple, to enter it is insanity. I've never put much stock in a claim to sanity, so I went in, of course. I'll just skip over the parts of the temple itself that I saw. The details are blurred in my mind. I think the fear did that, my mind blocking the memories so that I might function at least somewhat normally afterward. After a time wandering such unspeakable halls, I came upon a creature composed seemly of pure chaos. A Lich, and yes, it deserves the capital. The master of the temple, the demi-god it was made to worship. A dead thing, it's body crumbling about it as it spoke words of doom to me. It's jaw slowly crumbling before my eyes, bits of ash flaking off. I don't remember the exact words, but the message was clear. Leave, if I valued my life. Never one to take a warning without testing it's merits, I ignored it. After the lich king vanished in the proverbial puff of smoke, I started poking around the room, looking for anything of value. I noticed the one of the statues was rather odd, it hummed, or perhaps resonanted when I came near it. After a bit of testing I discovered that a collection of bones I was carrying, from a great warrior, caused the phenomenon, and after a bit of tinkering the statue slid aside, revealing a pit. Of course, I went down, and found myself in an eerily lit tunnel. Rather plain by the standards of the temple, it was even straight. Only the twisting light coming from the other end was enough to mark it as "not your ordinary mine tunnel." Traversing the corridor, I found myself in a word without bounds. Looking back I saw that the tunnel was gone, replaced by the shifting energy that I had entered. I can't really quantify what the place was, another world, somplace between worlds, it consisted of mind bending emptiness, and eye twisting patterns of light, lightning, color, and sound. It's denizens were quite hostile, yet easily dispatched. Although numerous, a single spell might slay all of them within it's range. No deterrent to an adventurer as seasoned as I, except for the fact that thier bodies seemed composed mostly of energy. Rather disorienting, but they die just the same. How long I wandered in that place I don't know. Having no day or night to judge by, I could only judge time by my own needs. Fortunately, I can produce my own provisions at need, or I would have run short long before I found the end of that place. And a strange end it was. I stepped forward and was suddenly wrenched into a room of fire. The heat was excruciating, but worse still was the creature that greeted me. All fangs and claws, it seemed. Though it had a nice, thick hide that apparently wasn't the least bit flammable. I can see why, considering its lair. Having dispatched it, I went the only way open to me, deeper into the temple. For I was once again in a more normal, if such a word can be applied, world. Not neccesarily the one I was born to, but at least its physics were similar to what I was used to. Wandering down the hallway I found myself in I passed a point where the walls suddenly burst into flame. The place was trapped, not that it surprised me much. I dusted the ash off myself and moved on, rounding a corner and nearly running headlong into a pack of mummies. Four on one isn't the best odds, of course, and I decided to try my luck elsewhere. I went back and turned down a side passage I noticed earlier. Only to discover a massive web-coated series of cavern-like rooms. A lair swarming with spiders, and at the center, the queen and mother of spiders. Altogether a nasty experience. I didn't stay for very long, having decided I'd had enough. I figured I'd come back later with some help if I wanted to squish this particular bug. Extricating myself carefully from the caverns, and still getting myself absolutley covered in cobwebs, I found myself back in the hallway. I tried a couple more doors and found them locked. Since I'd already decided it was time to leave I didn't bother looking for a key. I ran past the trap again trying to burn off the webs with some success, and teleported myself home, glad of still having my skin intact. Since that time I have grown accustomed to anonymity. My time is spent in great part meditating on things beyond this world, and a mist has formed about me that hides the details of my form. I am lost to this world. Gone the way all great elves do, not in blazing glory as a human would have it, but a slow loss of youth and vitality over centuries of time till all that remains is a body and memories. What I found of importance has left me with naught but memories, as all things change and move on. My battlegrounds are now those of the mind, and while the mind grows weary I seek another place to call home.